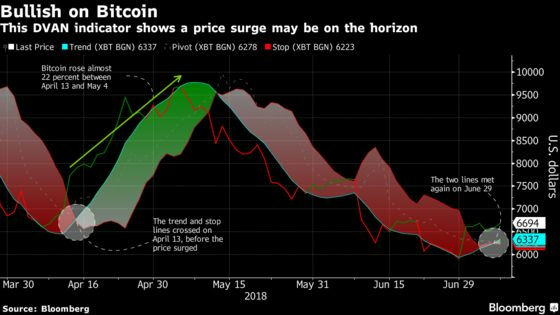 (Bloomberg) -- This technical indicator may show the world’s largest cryptocurrency is bucking a selling trend and gearing up for a price increase. Divergence Analysis Inc.’s (DVAN) Buying and Selling Pressure Indicator may be signaling positive times ahead for Bitcoin after the currency lost more than half its value this year. The DVAN indicator -- a proprietary analysis charting the coin’s current price, trend line and ideal exit points -- suggests the selling trend that began May 14 could end shortly, giving way to a potential bull run.